Today I'm dishing out a new follower requested review. Bad Habit Beauty has been consistently serving us quality for less, and I am definitely here for it! The timeless Modern Renaissance Palette by Anastasia Beverly Hills ($43) has a less expensive competitor called The Royals Palette ($10) available on the Shop Hush app and Shophush.com. I'll be comparing these two palettes in my usual detail oriented way so sit back and scroll honey! It's going to be good. The packaging for the Royals Palette is a Red toned marble design which is shiny and feels similar to vinyl whereas the Modern Renaissance has Mauve Suede Packaging. Mirror wise, the Royals has a slightly larger mirror, but the Modern Renaissance palette includes a brush unlike the Royals Palette. NOW to be clear, a dupe is not a replica. Replicas are known for their dangerous ingredients and mass production. A dupe, on the other hand, is made by real brands and offers a similar color range to an existing mainstream palette. Dupes are so similar it is often hard to tell the colors apart from the originals. 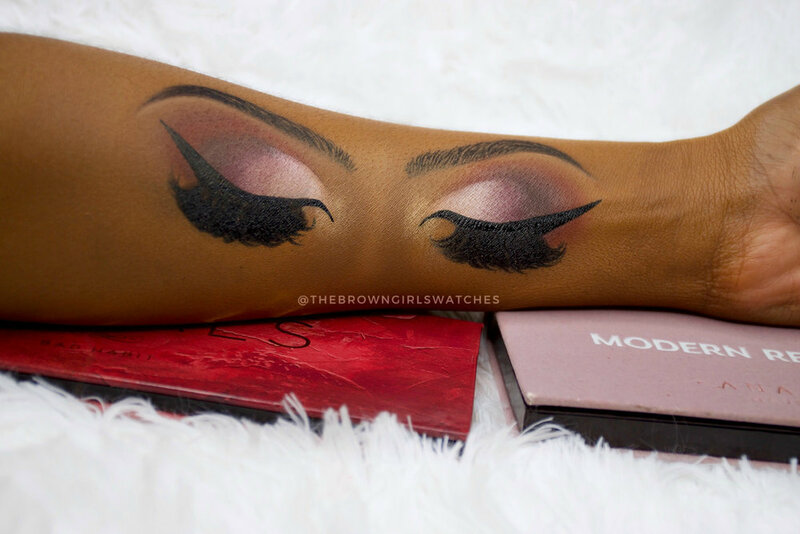 Now lets take a deeper look into this cheaper option of the Anasatasia Beverly Hills Modern Renaissance Palette. Off the bat, there is no noticeable difference in color scheme. The Royals palette is very pigmented and is giving the Modern Renaissance Palette some serious competition. We both know that performance is the real indicator though. So let's compare shade by shade and then get into the pros and cons of this $10 Dupe. Tempura from the Modern Renaissance is duped by "Treasury" in the Royals Palette. There is no visible difference in the shades when it comes to color. Golden Ochre from the Modern Renaissance is duped by "Opulent" in the Royals Palette. There is no visible difference in the shades when it comes to color. Vermeer from the Modern Renaissance is duped by "Queen" in the Royals Palette. The colors are strikingly similar and both reflect light similarly. Buon Fresco from the Modern Renaissance is duped by "Prim Rose" in the Royals Palette. 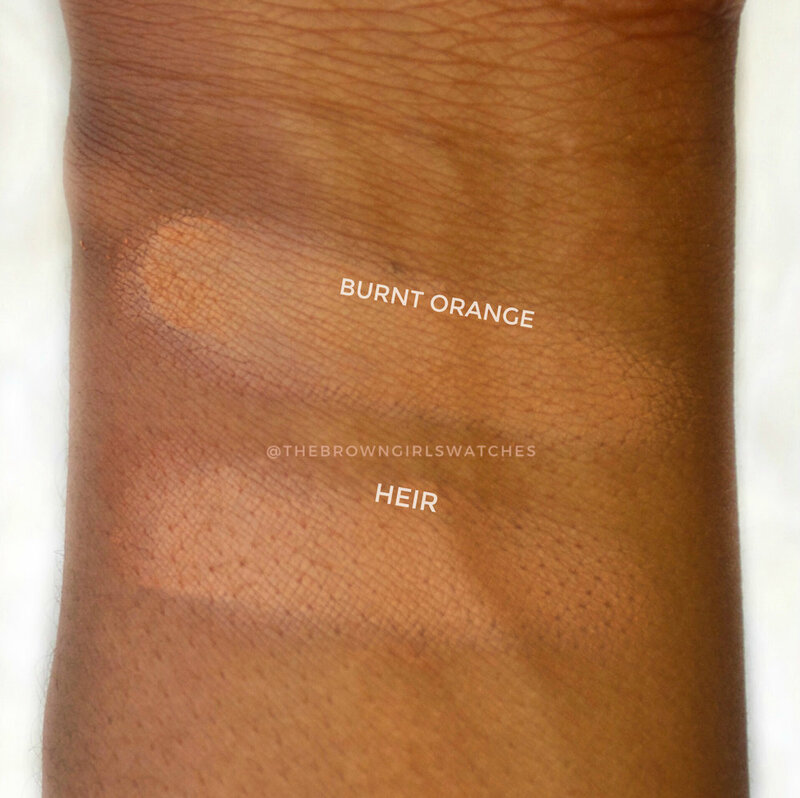 There is no visible difference in the shades when it comes to color, but these shades do differ in application. Buon Fresco is a lot easier to layer and blend into other shadows, whereas Prim Rose seems to sit on top of the shades rather than melt into the shades. Antique Bronze is duped by "Honor" in the Royals Palette. These shades are very similar, but Antique Bronze is a little more of a metallic shimmer than Honor. Love Letter from the Modern Renaissance is duped by "Majestic" in the Royals Palette. There is no visible difference in the shades it's pretty spot on. Cypress Umber from the Modern Renaissance is duped by "Grand" in the Royals Palette. 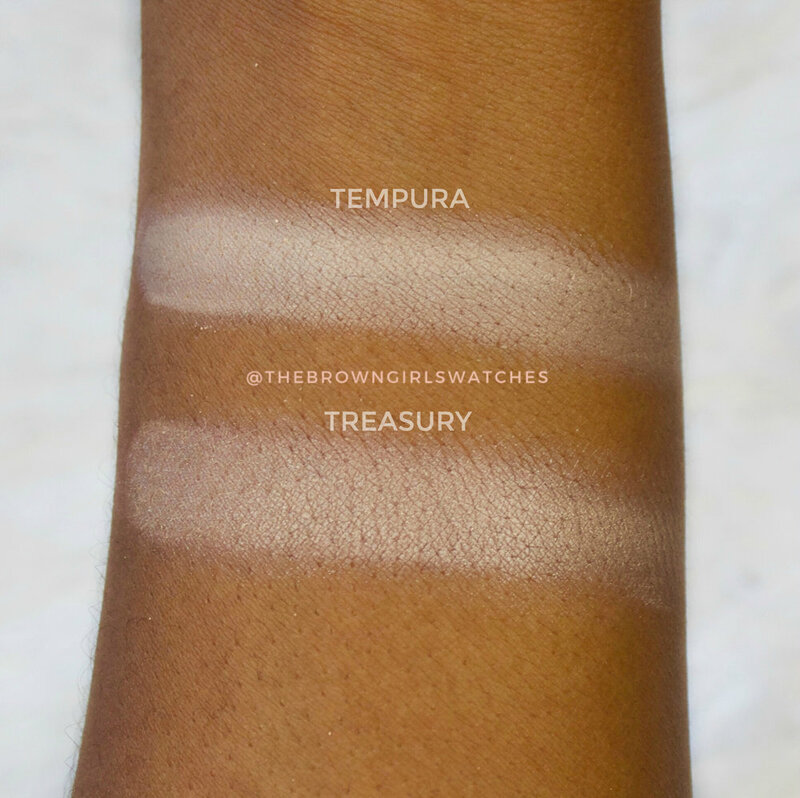 These shades look spot on though Cypress Umber is slightly more pigmented and easier to blend and build up on the eyes in comparison to "Grand". Raw Sienna from the Modern Renaissance is duped by "Nobile" in the Royals Palette. Pretty spot on dupe. Burnt Orange from the Modern Renaissance is duped by "Heir" in the Royals Palette. Pretty spot on dupe. Primavera from the Modern Renaissance Palette is duped by "Crown" in the Royals Palette. This shade is a spot on dupe. Red Ochre from the Modern Renaissance is duped by "Reign" in the Royals Palette. Pretty spot on dupe. Venetian Red from the Modern Renaissance is duped by "Regal" in the Royals Palette. Pretty spot on dupe. Warm Taupe from the Modern Renaissance is duped by "Throne" in the Royals Palette. Pretty spot on dupe. Realgar from the Modern Renaissance is duped by "Monarch" in the Royals Palette. Pretty spot on dupe. The Royals Palette Eye Shadow Look (on the left) and Modern Renaissance Eye Shadow Look (on the right). When it comes to each shade, the Royals Palette bring some solid dupes that are so spot on to the modern renaissance palette. However, Performance does differ significantly. Though the Royals palette is highly pigmented, it is harder to blend and harder to build up. When you try to layer colors on top of each other the pigments can be easily removed which causes patchiness. You must use an eyeshadow base and or concealer to avoid this during your application. Also, I would reccomend using a light hand. It's definitely workable, as you can see above, on the left I used the Royals palette and it got the job done. The colors are more difficult to blend and layer on the eyes. An eye shadow primer needed for application and you must build up the color and blend out patiently. The colors are very pigmented, but they do not blend together as easily as the Modern Renaissance. You need to use the proper brushes to avoid patchiness and to get the pigments to stick to the eyelids. Again, primer is essential for this to work at it's best. There is fallout and kickback. If you are heavy handed with products and a little rough with blending this can get muddy real quick. Don't be sloppy with it because Bad Habit Beauty Shadows can get muddy if you go overboard. Overall, you can't beat the price point. If your on a budget I definitely think its worth getting instead of the Modern Renaissance Palette. Just be prepared for a bit of a learning curve when it comes to applying these shadows and you'll be happy with your purchase. LET US KNOW, IS THIS A DUPE YOUR SWOOPING?